Hannah Martin and Jessica Bracken spearheaded a group of 22 volunteers to assist in serving the community of Millville today. 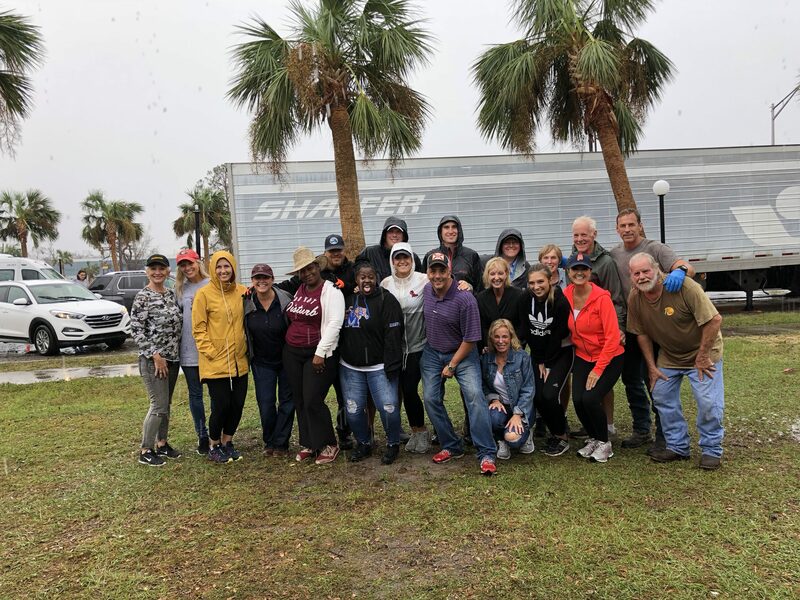 We took a limo bus provided by Emerald Luxury Transportation Transportation followed by three trailers and truck fulls of supplies and food. 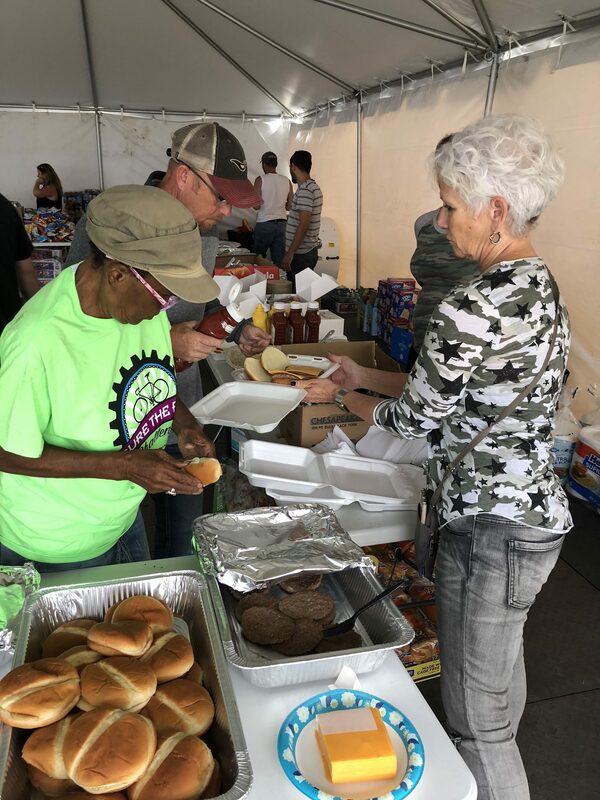 Supplies included the purchase of 1,000 hotdogs and hamburgers from Sam’s Club, along with 50 dozen donuts donated by The Donut Hole, and 25 casseroles created the night before by a team of volunteers at the Food For Thought kitchen. We arrived at Daffin Park which had a comfort station set up that included one large air-conditioned tent along with another large tent. 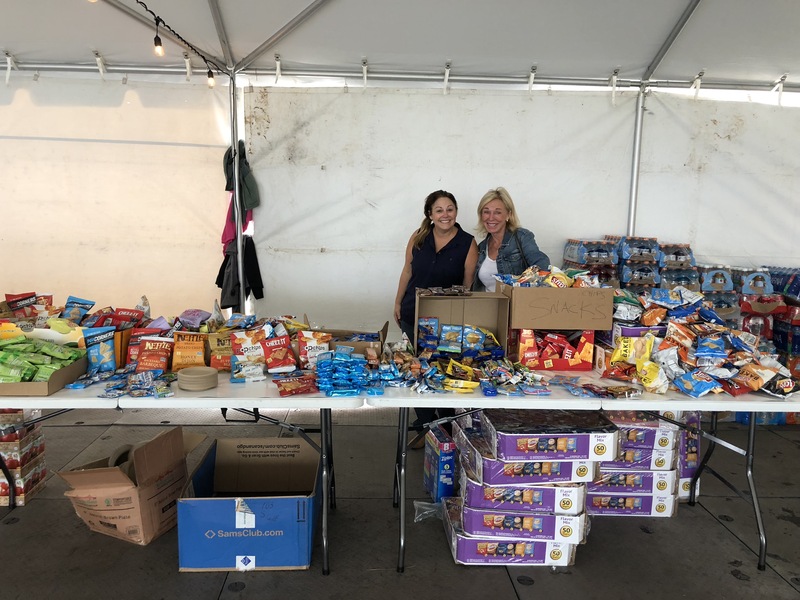 We utilized the air conditioned tent to create and organize our ‘supply store’ that consisted of donated items such as hygiene products, baby items, clothes, canned food, and other necessities. We set up the food station in the other tent that started with breakfast than flipped to three grills barbecuing the hamburgers and hotdogs, the 22 casseroles, and all of the sides. There was another volunteer group in there serving gumbo and the Red Cross was set up outside serving boxed lunches of BBQ sandwiches. We spoke to Arthur who spearheaded the area and he said traffic has been high every day, but we were a little concerned since there was rain in the forecast. We were glad to see people start trickling in and continue on throughout the day. We even sent some volunteers through the neighborhoods to drop off goodie bags directly to their doors, and by the end of day, we had almost nothing left. Panama City News Herald was in attendance and they published this article.